Jeffrey Manchester typically robbed McDonald’s. He typically robbed McDonald’s because in America, McDonald’s restaurants, wherever you go, are typically the same kind of building. Manchester’s genius – and it was genius, albeit of a scrappy, low-key nature – was to realise that in these near-identical McDonald’s buildings, near-identical rituals were often unfolding. If you found the right moment in the day to rob one McDonald’s – and the right access point to utilise – you had stumbled on a crime you could export across the country. McDonald’s has developed a easily replicable system for selling burgers. Because of this, Manchester had developed an easily replicable system for robbing McDonald’s. I read about Manchester in A Burglar’s Guide to the City, an absolutely incredible book that examines the intersection of urban planning and crime. It’s written by Geoff Manaugh, who also writes BLDGBLOG. I don’t have my copy to hand at the moment, but I think I remember that Manaugh is using Manchester as a way of exploring what some architects refer to as sequences. Buildings have their own sequences – patterns of behaviour that they encourage and sometimes generate. If you go into a church to pray – this is one of Manaugh’s examples – you are fulfilling that building’s sequence. As for Manchester? Was Manchester breaking the sequence of a McDonald’s, or was he revealing another? At the time I read A Burglar’s Guide to the City, Manchester made me think about Hitman. Of course! A game about discovering the sequence of a space and working out how to turn it to your end. But I now see that Hitman’s not the richest example of what Manaugh’s talking about. In Hitman, most of the sequences the player develops have been foreseen by the designers. That’s why they allow you to leave the taps running in that backstage bathroom, for example, or why the guy you’re after always stops at the same point for a cigarette on his way to his meeting with the arms dealer. Recently I’ve been playing a game that has revealed a sequence buried within it that seems to have evolved organically. I can’t be sure, but I reckon the developers didn’t have this sequence in mind when they put the thing together. Part of the reason, in this case, is that the developers weren’t constructing a template from scratch – they were ‘borrowing’ someone else’s. 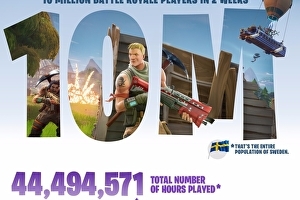 The game is Fornite’s Battle Royale mode. The more I’ve played, the more I’ve realised that an awful lot of Battle Royale matches end pretty much the same way.